The Howard Stoll Family Pavilion is located in the 18 acre City Park. The Pavilion was dedicated July 4, 1985, to Howard Stoll who was the former longtime band director at Plymouth High School. Benches are lined in rows in front of the stage and looking back from it, there is a gazebo. A large wood cutout of the state of Wisconsin with "Welcome to Plymouth We Like It Here" written on it is centered at the back of the pavilion. A clock sits atop the pavilion, a gift in 1995 from the Plymouth General Federation of Woman's Club. The Pavilion offers free concerts during the summer from mid June through mid August. A variety of music, such as the Carl Laack orchestra, is presented. The highlight of the summer concert season is German night, which includes a beer garden and a German meal with homemade desserts; the high school band performs that evening in authentic German costumes. This event is a fundraiser for the Plymouth Municipal Band which plays at most of the summer scheduled concerts. Other bands are also sprinkled throughout the summer schedule. 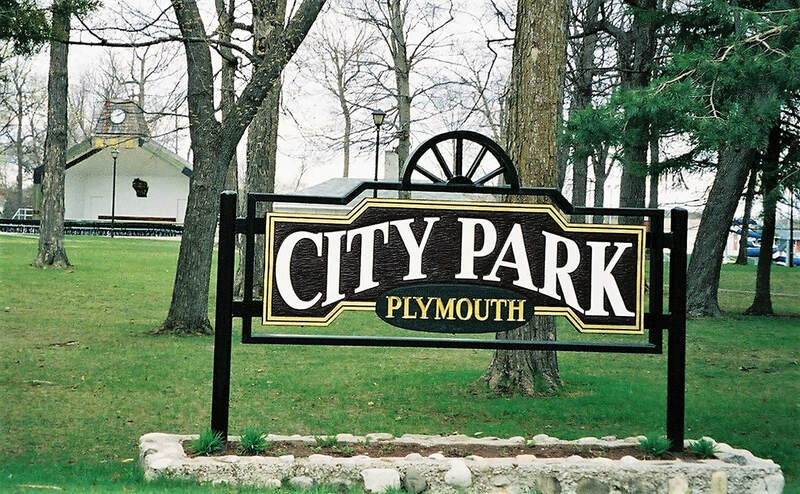 ​City Park has other attractive features: the Aquatic Center, the 7th Element Skate Park, a lighted softball diamond, concession stand, rest rooms, basketball court, volleyball court, playground equipment, picnic areas, and lighted winter sledding hill. The clock sits atop the pavilion.